Navy Commander … physician … salesman … retired NFL record-holder … what do they all have in common? They are all happily using the Bank On Yourself safe wealth-building method to either beef up or even serve as the foundation of their retirement savings plans. And these are just four of the hundreds of thousands of satisfied Bank On Yourselfers. The Bank On Yourself strategy uses specially-designed dividend-paying whole life insurance to create a secure savings plan. The policies grow by a guaranteed and pre-set amount every year. The growth is exponential, meaning it gets more efficient every year the policy is held, providing peak growth at the time many people need it most – retirement. A new study by the Wall Street Journal confirms it: Many Americans will have to trade their “golden years” for a retirement filled with scrimping and sacrifice. Pre-retirees aged 55 through 70 today are the first generation that was “left on their own” to prepare for retirement, according to Alicia Munnell, Director of the Boston College Center for Retirement Research. As pension plans that provide a guaranteed income for life disappeared, 401(k)s, 403(b)s, IRAs and similar government and employer-sponsored plans replaced them. “Their median incomes, including Social Security and retirement fund receipts, haven’t risen in years, they have high debt, are often paying off children’s educations and are dipping into savings for aging parents. 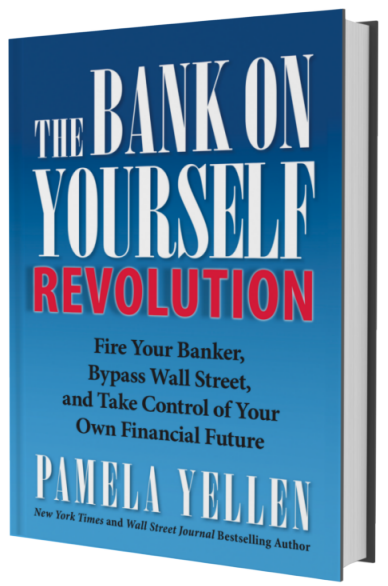 Pamela Yellen’s book, The Bank On Yourself Revolution, hit the bookstores in 2014. It was an overnight sensation, landing on the bestseller lists of The New York Times, Amazon.com (where it was a #1 bestseller), and USA Today. Shoppers on the world’s largest bookstore, Amazon.com, have consistently praised all of Pamela Yellen’s books … and this one is no exception. And in fact, nearly 80% of reviewers have given Pamela Yellen’s Bank On Yourself Revolution a 4-star or 5-star review. Many also used glowing terms to describe their personal experiences with the Bank On Yourself concept. Americans are saving much less and spending more – even though their real disposable incomes are unchanged. The savings rate just fell to a 10-year low of 3.1%, according to the Commerce Department. What’s most worrisome to economists is that savings rates below 4% occurred before the last two major market crashes, as people felt what turned out to be a false sense of security, due to rising stock prices and/or home values. I recently wrote how the current bull market is the second longest in modern history. If it manages to last until summer, it will become the longest-running bull market at 9½ years. In addition, historically, the longer a bull market lasts, the harder and deeper it crashes. Which indicates the optimism that’s caused Americans to save less and spend more is misplaced. And, to take a line from the movie Grease, that means a lot of people are cruisin’ for a bruisin’.